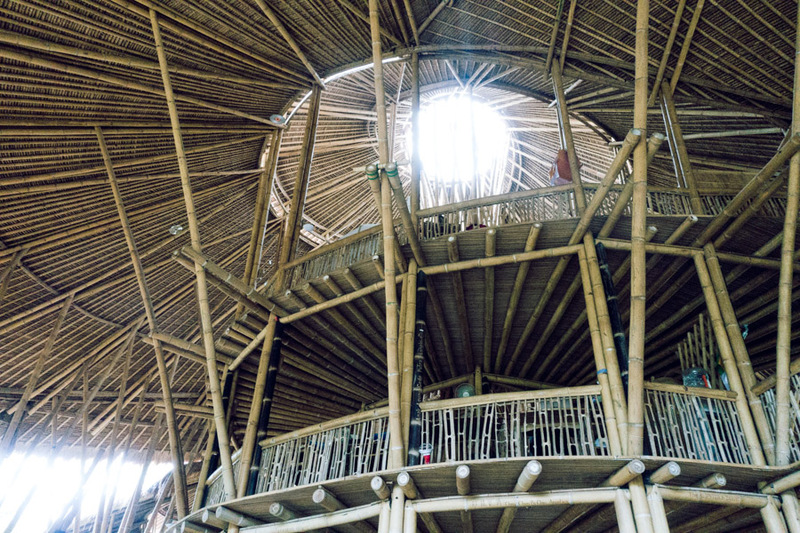 One of the reasons for going to Bali was actually to check out this school – Green School. Our friends Jennifer & Micke’s kids just started and they talking about it made us so curious and I had to to some job about it. Read about the girls first week in this school right here. And check out this clip with green schools founder – John Hardy. Anyway this school is about in the middle of nowhere between Ubud and the beach. Basically in the jungle. It is made of bamboo and kids from over 37 countries attend with teachers from I think 17 nationalities. The school is a bout learning kids & the community about how to make the world more sustainable. It has a new approach to learning and teaching. There is organic cafes on the premises and also places for the parents to meet and work. If you go to Bali it is possible to take a tour on campus. We we were not aloud to take photos of the kids and staff but head over to Jennifers blog to see more. This bridge is heading towards the sleeping quarters for some of the boarding school kids and to the local Chocolate factory! Nice view on the way to school. We still had the worst jet lag and didn’t have time to eat a proper breakfast plus really really hot – Beppe got overheated and a bit sick but still loved the school. Erik is checking out a student project. They built a sort of self regulated (I’m sure there is a proper word for this in English but can’t find it in my head at the moment) watering and nourishing system. The water for the plants comes from a pond with fish that fertilizes the soil and the plants gives oxygen to the fish. Can you see what makes the roof in this greenhouse? Yes it is car windows! Smart. Other students builds bikes and small vehicles out of bamboo. There are alot of projects like this. Another is Bye bye plastic bags that wants to help the people of Bali to say no to plastic bags. Some students also made a project to get cooking oil to become fuel to the school bus. The schools kind of holy stone. There is also a wrestling mud pit. The school also have cows, pigs, chickens and other pets like this massive spider. The. toilets – one stone for number one and another for number 2! And Beppe actually found two football fields! Thanks Green school for having us!